Are far as a Content Management System (CMS) goes it’s hard to beat WordPress. It’s a powerful application that runs millions of websites on the internet (we should know as WordPress Hosting Experts!). WordPress is in constant development and going as strong as ever. The team behind the Worlds’ most popular blog software are continually working to ensure the application is safe, secure and adding fresh new features. What’s different about version 5? 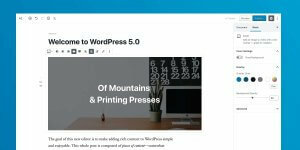 While previous versions of WordPress have been incremental from version 5 onwards the developers plan to release new updates when they’re ready. This should mean that new releases are much higher quality and enables them to focus on new features rather than deadlines. What we’re talking about of course is the new block-based editor dubbed ‘Gutenberg’. While this might sound like a feature a lot of WordPress themes already have the biggest change is that this is going to be included in WordPress 5 onwards. The new block editor enables website owners to build their websites easily and quickly without expensive plugins or page builders. This means you will easily be able to add new text boxes, images, videos, widgets and other items to your page in seconds rather than relying on plugins or any coding. This speeds up the building process for people with little to no experience whatsoever. For those who are worried about plugins, don’t worry as a lot of plugins should ‘plug-in’ to Gutenberg easily to enhance your page building experience. Don’t worry if you prefer your own builder though as you’ll still be able to use them. What else is new about the new update? Another major change to take to the stage is actually something for the web developers who create custom themes. The new version of WordPress promises to be much more accessible due to the new block based editor. The ability to send and receive data to your WordPress site using the Rest-API has been upgraded too allowing developers to create applications more easily. How will it affect me if I upgrade? Right out the box you may notice a few changes around your WordPress dashboard. At this point it’s hard to say which plugins will word straight away and we always recommend copying your site to a development area before making any significant changes. Contact our support team if you would like help with this. I need help or have questions about the new update? If you would like to find out more about WordPress V5 you can get in touch with our specialised teams who are on hand to help. Just call us on 0800 107 7979 or send us an email to sales@catalyst2.com. Alternatively you can get in touch via Live Chat through our website.